Launched in 2011, Juno arrived at Jupiter to start its science mission at approximately 8pm Pacific time on July 4th, 2016. It's the fastest and farthest solar powered mission ever built, and will unlock mysteries about the very origin of our Solar System. With its unprecedented Junocam, it also brings "citizen science" to a whole new scale, where the public will get to choose collections of and process real data in a way no other NASA mission has allowed before. 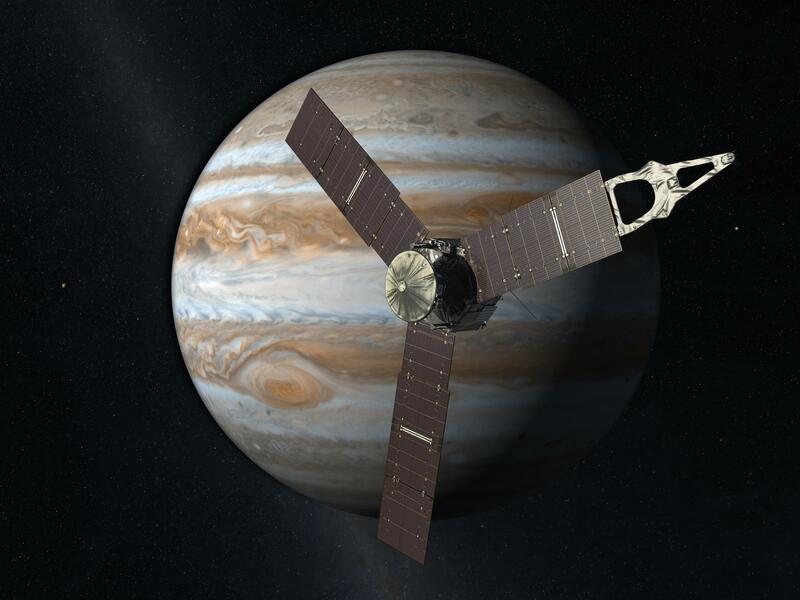 For Alliance members, listen to our insightful telecon with Scott Bolton, the principle investigator of the mission, and learn why Juno is truly the most exciting way to learn about the king of our Solar System. The telecon site also includes more downloadable multimedia, information, presentation slides, printable models, and hands on activities. And here's the science update telecon from 2017. For Alliance members, remember to share any Juno exhibits, programs, or events that you host for your audiences. They can be from simple and small, all the way to complex and big. Whatever you're doing with Juno, past, present, or future, NASA wants to hear about it! In Feb 2017, NASA decided to adjust the orbits from the original plan due to concerns about safety. You can read the full article here. In May 2017, NASA released the first science results from Juno. 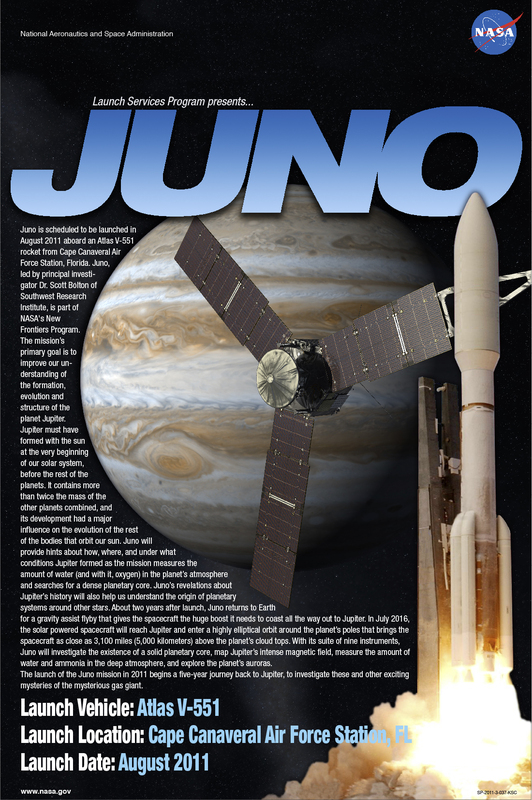 Put up Juno posters, infographics, 3D models, and/or fact sheets to add to your exhibits (downloadable links at the bottom). If you're only going to do one, we'd suggest the Juno Spacecraft image. Have a 3D printer? Try printing out the 3D model. Great for visually impaired (or any) students to feel the spacecraft itself. Also, the models are viewable using free, open source software to allow students to manipulate and inspect every nook and cranny. The Alliance now has an OBJ formated 3D model, for use in planetarium shows and other formats. See the "Latest and Greatest" Juno images in the NASA Juno gallery. Include them in any planetarium shows or presentations. Show some of your favorite Juno videos, some downloadable below, and on the Juno website. Have them playing in a loop at a station on your museum floor, or project them onto a wall. Embed them onto your Juno event website for your visitors! Remember to copy and paste in to the html "Source" of your page. Use them in your classes or workshops to introduce and engage concepts. There are many other images and videos, all of which are free to download at the Juno Media Gallery. Start with these Story Videos or the great Interviews of the team, as an amazing way to inspire young explorers! Also, the Alliance has a copy of this Juno Close Approach movie, but it's 1.4 GB, so email us for a download link. Show the Juno: Mission to Jupiter 360 video in your planetarium dome or on your smartphone! At only 4 minutes long, use it in pieces to talk about Juno or use the whole thing for quick, free, teaser experiences in the dome. Set up a NASA Eyes on Juno station on your museum floor or in your classroom! Updated daily, this is the premier way to explore all of NASA's active missions. Update an old educational curriculum (like a summer camp) by including Juno information, multimedia, and/or data. 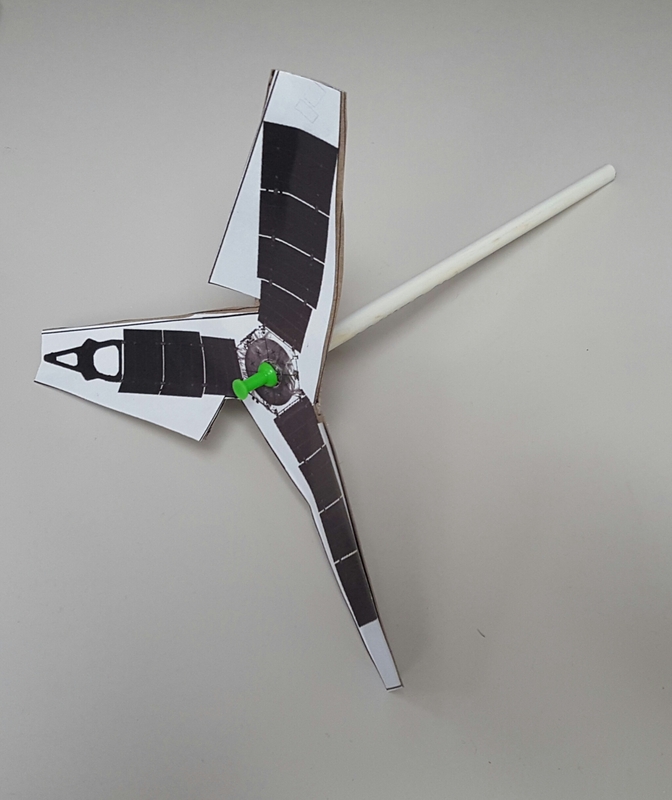 Instead of making the old paper shuttles, make the paper Juno model (official) or a simpler Juno Pinwheel (unoffical). Note that the model is detailed, but can be scaled to be easier by omitting various parts. Note that the Juno spacecraft really does spin in a counter clockwise direction, just like the pinwheel does, and it also makes a great educational activity about engineering and design. The Juno Pinwheel can be mounted using different methods; the image to the right shows a thumbtack mounting it onto the tip of a standard pencil eraser. Instead of showing that old picture of Jupiter or that old spacecraft, try a new Junocam picture and an Ultra HD artist's conception of Juno. 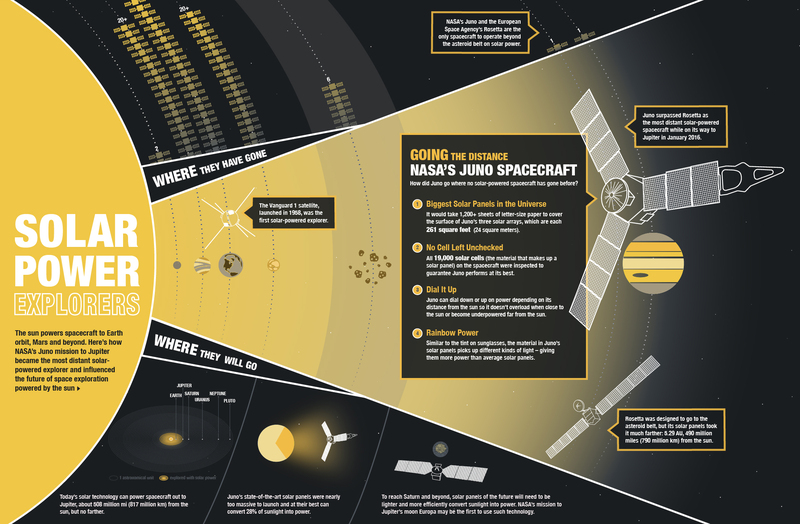 Try some of the Juno-themed NASA Wavelength educational materials in your existing classes. Use any or all of the "Explore! Jupiter's Family Secrets" educational curriculum with your audiences. Use our member exclusive "Gravity of Jupiter" planetarium show/classroom curriculum in whole or in parts. Take all of the free NASA data, footage, animations, and/or images/infographics and create your very own Juno website or video for your own audiences. Have your students/your audience participate in the JunoCam citizen science project. This is great for STEM and STEAM (including Art) projects and activities. NASA needs artists, too! Show your audience how to break down the barrier between art and science, as they see and create some beautiful renderings of Jupiter. Have your audiences plan and discuss where THEY think important Jovian discoveries lie! For younger or older kids, Try this foldable, coloring Solar System. Host a July 4th / Jupiter arrival anniversary party, even if it's not on July 4th! Make a round cake and decorate it like Jupiter. Get some Jupiter themed music/decorations. Every day is a day to celebrate independence. Want even more ideas? Just email us with your details (e.g. what kind of audience do you want to reach? Timeframe? Etc.) and we'll be happy to suggest some specific possibilities for you. Below is a sample of the kinds of great multimedia resources you can use to engage your audiences.